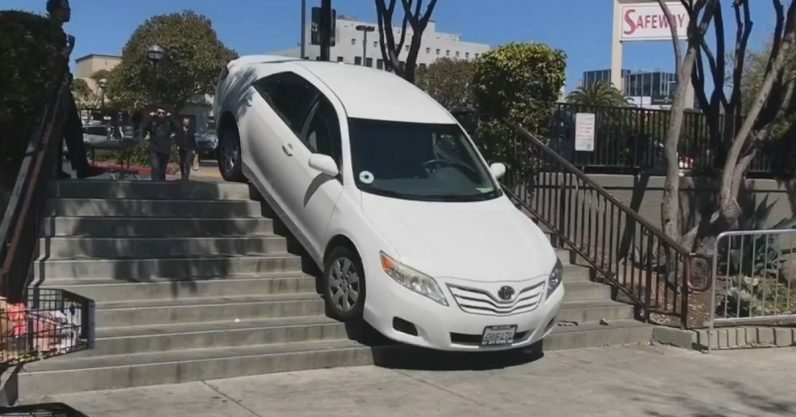 An Uber driver in San Francisco took a wrong turn, and got their car stuck after attempting to drive down a flight of stairs. The poor car hung out there for several minutes before a tow truck arrived to rescue it. The car in question, a white Toyota Camry, lodged nose-down to the pavement. The driver apparently decided to take a walkway designed for humans, and the stars might have been a shortcut leading back to the road. I’m hoping the backstory is that the driver accidentally set their Google Maps directions to walking, rather than driving, and ended up on the stairs before they realized their error. Uber’s been in a bit of hot water recently due to one of its driverless cars failing to stop for a pedestrian, resulting in the death of a woman and some truly disturbing dashcam footage. This has prompted a conversation about whether driverless cars are ready for primetime just yet. But, as we see here, humans aren’t exactly infallible. Not to worry, though: According to KRON4 news station, no one was injured. The poor car just looks incredibly silly.